Our guest this evening is a Professor of Wine Science and researcher at Brock University’s Cool Climate Oenology and Viticulture Institute, in Niagara. He holds a doctorate in Wine Science from Lincoln University in Canterbury. His focus is on wine flavour and sensory science. He has published more than 100 papers, patents, book chapters and conference proceedings. He is the inventor of the white wine mouthfeel wheel and the supertasting kit, and is co-developer of the Wine Aroma Kits. He’s the recipient of a number of research awards, and is passionate about wine education, and of course, wine. And he joins me live now from his home in Niagara: Welcome to the Sunday Sipper Club Dr. Gary Pickering! Click on the arrow above to hear Gary’s story. 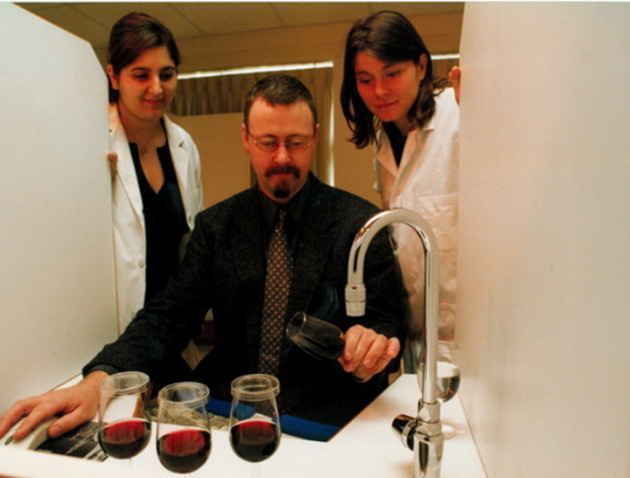 Dr. Gary Pickering, a Professor of Wine Science and researcher at Brock University’s Cool Climate Oenology and Viticulture Institute, in Niagara, Canada. 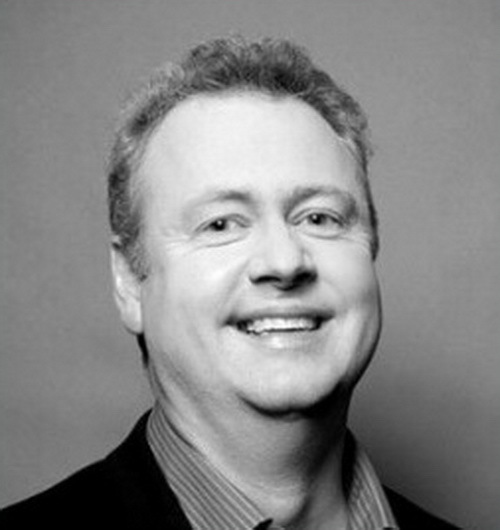 He holds a doctorate in Wine Science from Lincoln University in Canterbury, and prior to his current appointment was a lecturer at Charles Stuart University in Australia and senior lecturer and research manager at the Eastern Institute of Technology in New Zealand. 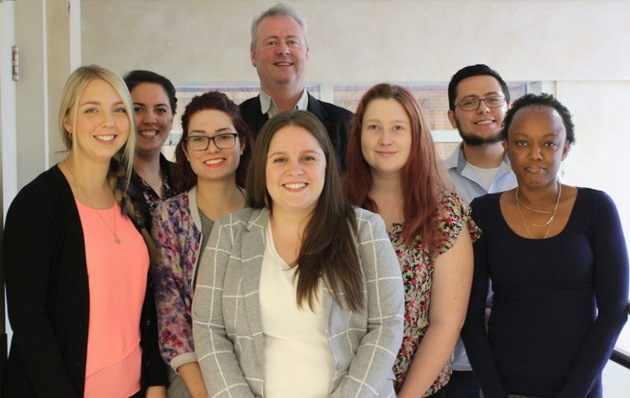 His teaching and research focus on wine flavour, sensory science and development of novel wine products and processes, and he has published over 100 papers, patents, book chapters and conference proceedings. Gary is the recipient of a number of research awards, is passionate about wine and wine education, and is working on a number of books. 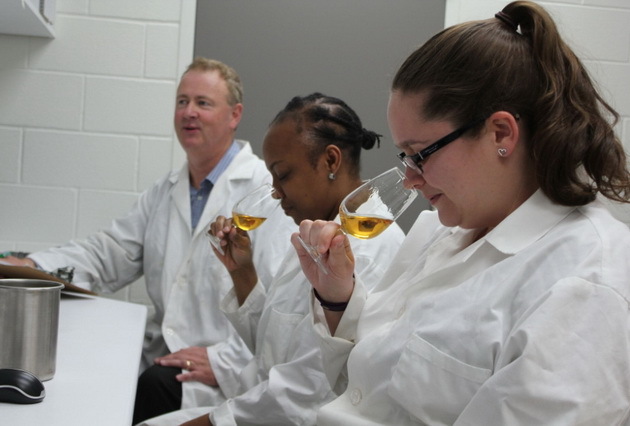 Gary is inventor of the white wine mouthfeel wheel and the supertasting kit, and is co-developer of the Wine Aroma Kits. 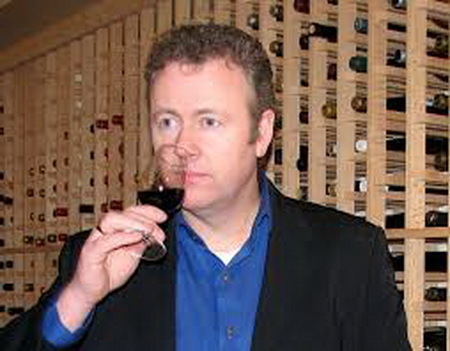 In addition to his work as President of Picksen International Inc, Gary serves as an international wine judge, most recently for Cuvee and InterVin. He also enjoys a good glass of wine! What was the exact moment when you decided to teach wine in an academic setting rather than say make wine? Where were you? Why were you intrigued? Do more women than men generally tend to be supertasters? 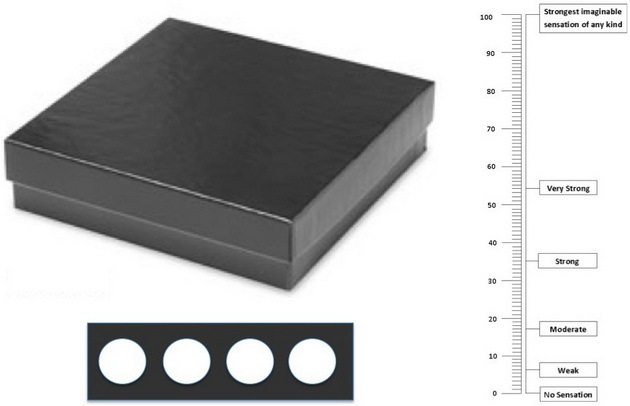 What is the wine supertaster kit? Is it mainly those in the wine business who buy it? Have any famous people inside or outside the wine business used it? What was the most surprising insight you discovered while creating the kit? What’s the most interesting thing that someone has said about the kit? How does taste sensitivity, in general, influence peoples’ wine behaviour? Is umami important in wine? Is this in any way related to your research on how those who are good at perceiving sensations, like bitterness and astringency in food, more likely to consume all kinds of alcoholic beverages, while those who respond strongly to qualities such as sourness and umami are less likely to drink wine in particular? Why umami in particular as it means savoury or tasty generally? Taste also includes “chemesthetic” responses to astringency and metallic sensations as well as prickliness, viscosity and heat. 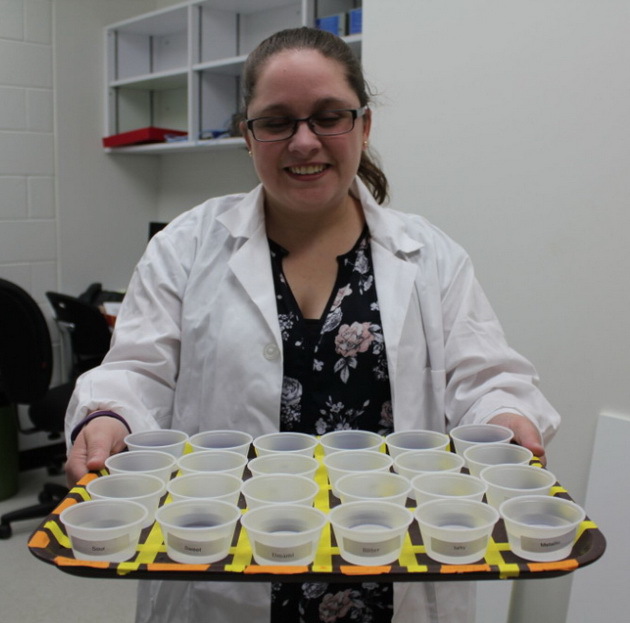 How do these taste sensations affect whether we like wine or not? What were the consequences or changes, if any, in the wine industry, or for the people involved? 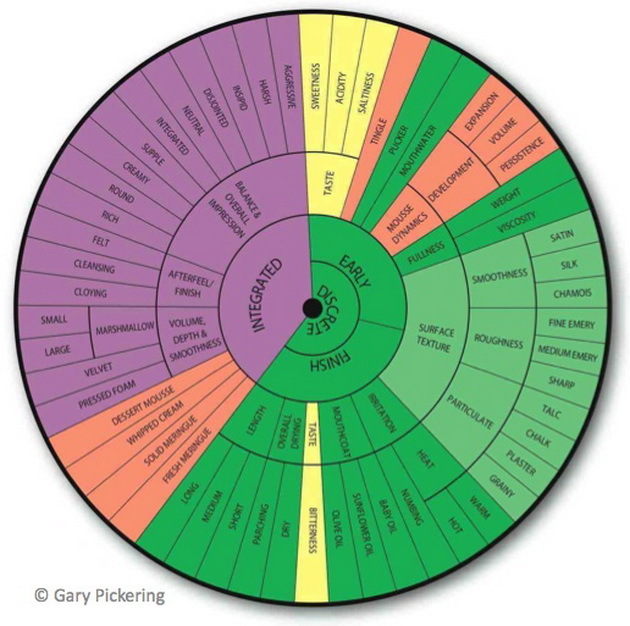 Tell us about the white wine mouthfeel wheel? Are you going to develop one for red wine? Other wine types? What’s the biggest difference in mouthfeel for red and white wines? We tend to focus on wine’s aromas and flavours. Why is mouthfeel important in wine? Tom Noland · 29:04 I agree and I always try to give a description of body of the wine in my description. Mouth feel is easy to detect but difficult to describe. Lise Charest Gagne · 41:37 Some different textures put me in a mood. Example crisp texture makes me what to run off the dock into the lake. Full body silky makes me want to get in front of the fire..
Phyllis Cook · 26:08 Hi, I am not a super-taster, but I would sure love to be! I do enjoy good wine and cheese anyway, no matter what. Lori Sweet · 42:10 Is there a mouthfeel wheel for both red and white? Patti Wright Hollander · 50:06 Enjoyed the discussion so very much. Lise Charest Gagne · 28:48 What do the formal wine training agencies think of these mouthfeel terms? Melanie Lloyd · 50:15 Loved the topic. Thanks Dr Gary Pickering and Natalie! Tom Noland · 52:27 Definitely worth the time. Great topic. Michael Garboll · 46:34 Thank you Dr. Gary for my ‘bubbles-super taster. Melanie Lloyd · 24:53 ..so does this mean one can learn to be a super taster or just a better taster? Jim Clarke · 17:12 How linked is one’s sense of smell to sense of taste? Jim Clarke · 15:23 Does taste ‘ability’ degrade with age? Michael Garboll · 24:38 Awesome topic Natalie/Dr.Gary. There are times , often when I have a respiratory tract viral infection and to my chagrin, my taste in wine becomes temporarily ( thank heaven) ‘distorted’ .Is there a physiological reason for this? Jim Clarke · 21:49 is there any way to improve the chance of regaining/improving smell and/or taste? 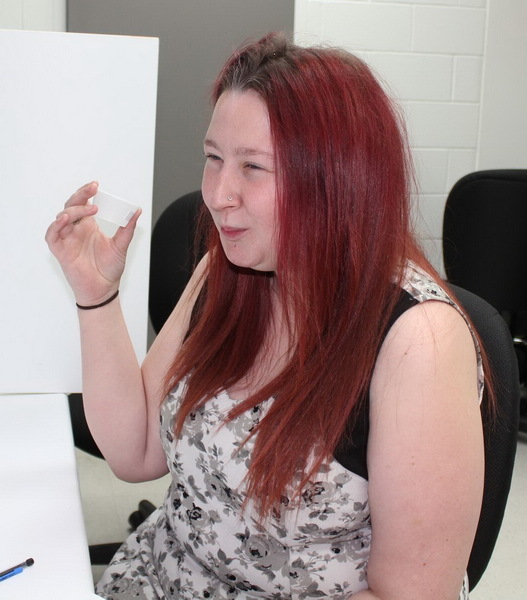 Tom Noland · 21:12 I thought I was a super taster until I got tested and nothing! My sons are super tasters. However, I do think my sense of smell is quite acute. I can smell someone smoking in the area (upwind) up to 100 feet away. This seems to enhance my enjoyment of wine. Jim Clarke · 28:49 I was at the Winnipeg Wine show years ago, and realized after a while that when tasting I was literally feeling shapes on my palate, ie the tastes hit y mouth in a geometric shape, round, flat,points, and even triangular – as if only specific taste buds were being hit…. 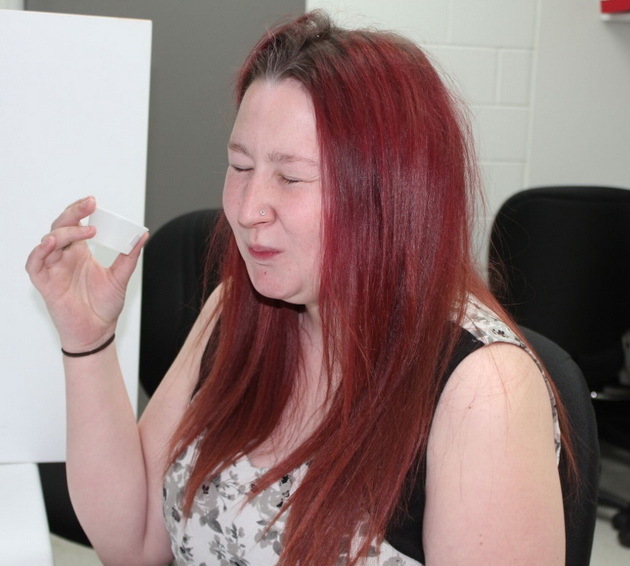 Michael Garboll · 43:05 My daughter-in-law deems herself a super taster. She is not enamoured with ‘bubblies’. I feel sad that this happens for ‘special occasion situations .It’s often hard to ‘please everyone’ in seasoning, and therefore pairing a wine with food. Any best answer Dr. G to do a ‘work around’. Jim Clarke · 50:17 Recommended New Zealand Whites? Paul E Hollander · 51:28 Good discussion this evening. Elaine Bruce · 28:16 Is ‘texture’ related to body ? Elaine Bruce · 7:27 Hi – fascinating topic !!! Elaine Bruce · 24:56 Love the sensory kits ! Michael Garboll · 53:19 Science rules ! Jim Clarke · 51:34 How about cheese super-tasters? Deborah Podurgiel · 53:18 Great Chat. Thank You, Natalie, Dr. Gary. Lori Sweet · 50:27 Great discussion! Michael Garboll · 49:33 Awesome guy! Elaine Bruce · 17:06 I lost my sense of smell and taste for a bit *due to health- they all came back in stages, but even more so now. I dont think anyone quite believed me and it was only when a chef called Grant Achatz described what happened to him, that it all made sense. Peter Neilson · 44:25 Any comment on “taste memory”?. I was spoiled many years ago, when, around age 22, I was lucky enough to share a bottle of 1961 Musigny. It was, without any question whatsoever, the most delicious, memorable wine in my life, and i have spent my life trying to repeat that experience – without success. Musigny is, unfortunately, out of my price range. 8-) But I still remember it (and routinely describe it) as drinking liquid velvet, with notes of tobacco, rich earth and leather. It was exquisite, and I can remember it like it was yesterday. Is this memory real, or imagined? Peter Neilson · 18:41 I used to consider myself a super-taster. I could taste very subtle nuances in food (and wine) that others could not taste. I could also smell someone smoking in a car ahead of us on 401. I caught a really bad cold/flu two years ago, which nullified my sense of taste while I was sick (not unusual with a cold), but when I got better,. that “super sense ” I had previously, seemed to be gone. I believe some of that has returned since than. But I sure don’t have it to the extent I had before. However, my son seems to have inherited it. When we were tasting in Niagara two weeks ago, we were at Two Sisters Winery,and they opened a very nice Cabernet Franc for us to taste. The server asked us what we thought, and my son, swirling it commented he hadn’t tasted it yet, because all he could smell so far was the cork. He was trying to swirl that way before he gave it a taste. Tom Noland · 41:15 Question: Physiologically ripe tannins seem to be the goal of most wine makers, so what is a physiologically ripe tannin? 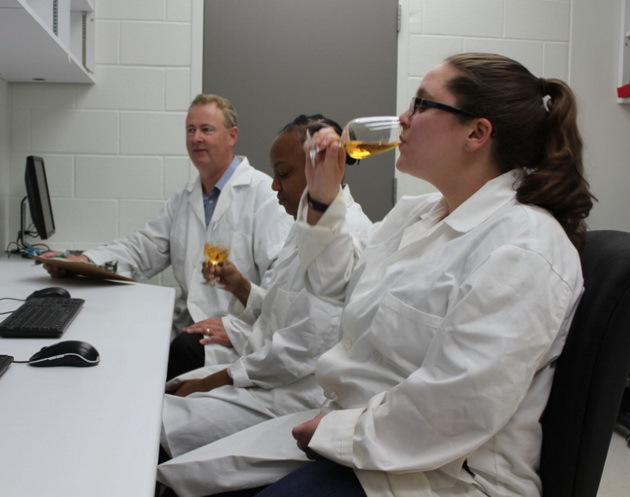 Michael Garboll · 48:59 Does alcohol percentage alter tasting? Lise Charest Gagne · 45:45 Question can supertasters tolerate made to order single notes wines? Tom Noland · 53:09 Tasting wheel with different textures was the most valuable. Phyllis Cook · 54:25 Fantastic stuff! Beverly Asleson · 32:25 What is your favorite wine?